The GBC Foton 30 is a fully automated desktop pouch-free laminator that feeds, laminates and trims with the touch of a button. It is equipped with built-in auto feeder and trimmer for fully automatic lamination, freeing up your time for other activities. This laminator accommodates documents ranging from 5" x 6" to 11" x 17" paper size. It is very easy to use. Load up to 30 sheets, press run and walk away. The integrated deskew system ensures perfect positioning and borders of documents. Film feeds from cartridge for jam-free lamination. The GBC Foton 30 is also featured with internally heated four roller system for producing high quality output. 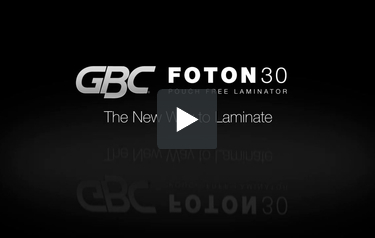 GBC Foton 30 Desktop Automatic Laminator with Integrated Feeder and Trimmer- the new way to laminate. Load and Go operation! Foton starts automatically after warm-up. Three operation modes produce perfect quality lamination for most types of documents. Easy to load self-threading carttidge makes changing film simple.